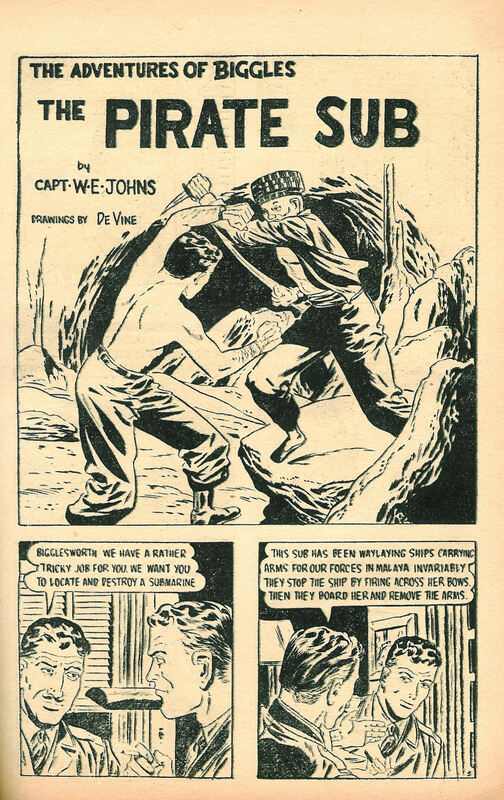 “W.E. 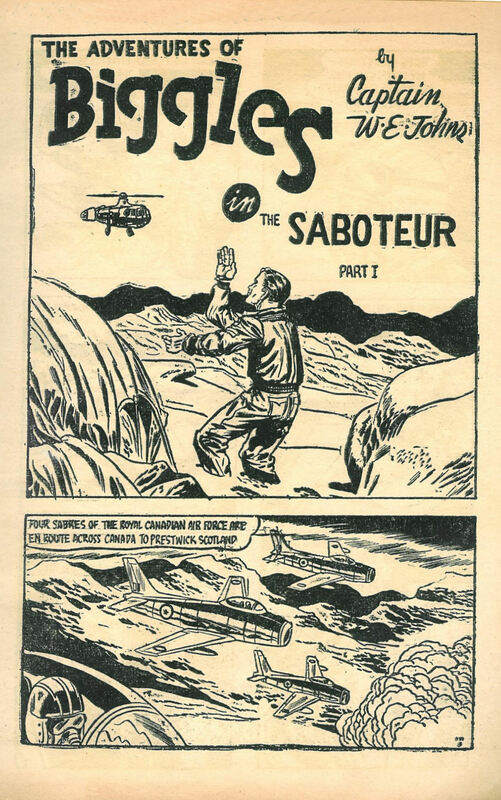 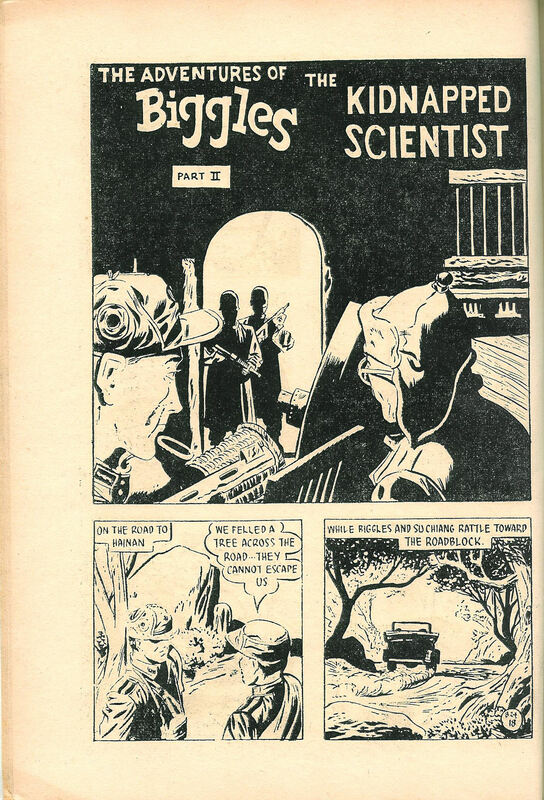 Johns” biggles stories and stories written by others especially for the comic. 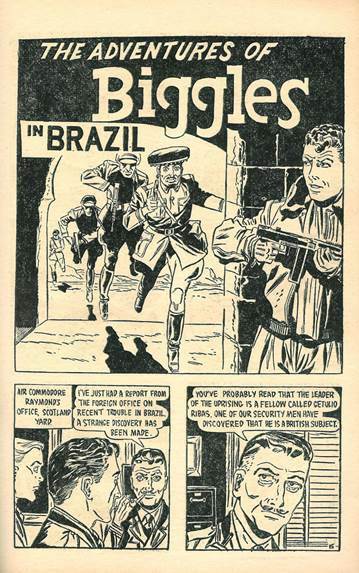 However there was an attempt to publish stories from this Australian comic in the uk. 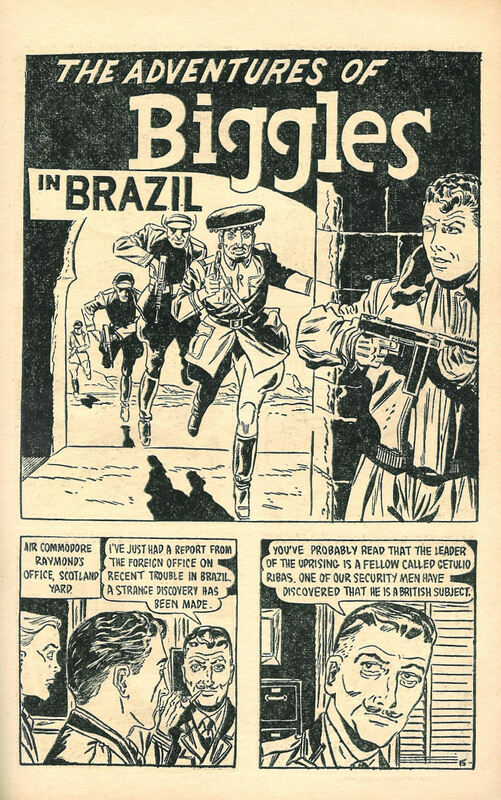 It was apparently unsuccessful as only nine issues of the “British edition” of the comic were ever published. 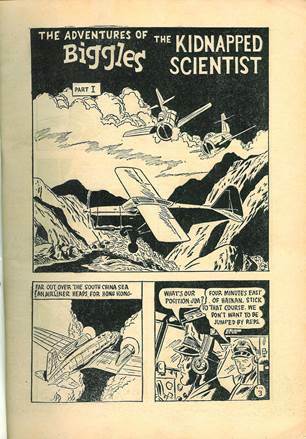 This web page displays those nine issues and gives guide to the contents. 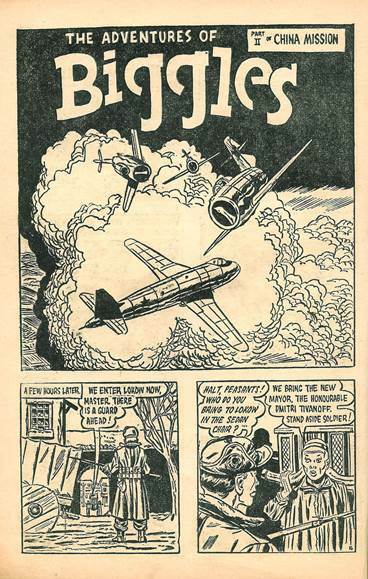 Issue one of “The Air Adventures of Biggles” is undated. 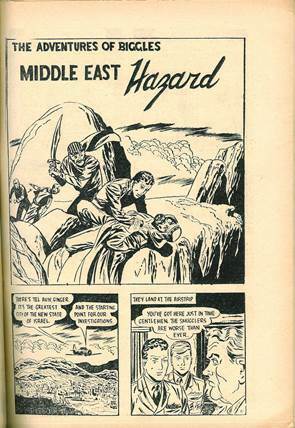 It was published in the UK in the 1950s – if anyone knows the exact date, then please contact me. Issue one contained 68 pages (but this includes the cover pages, so there were only 64 pages inside the covers) and FIVE stories. 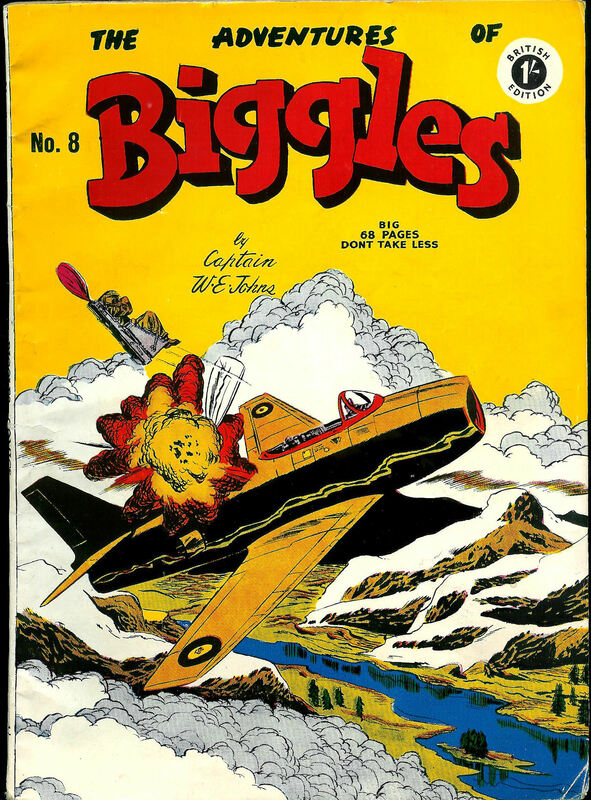 The first three stories were “Biggles” stories and you can see the first pages of those three stories above. 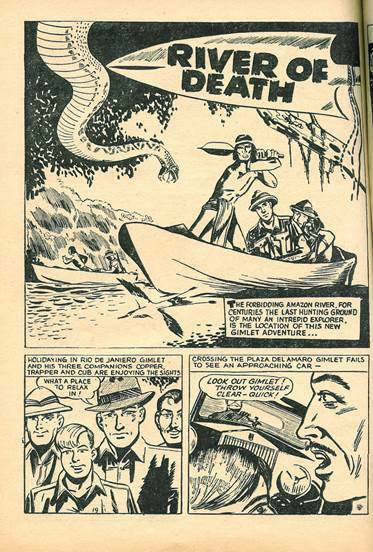 Obviously the second story was a continuation of the first. 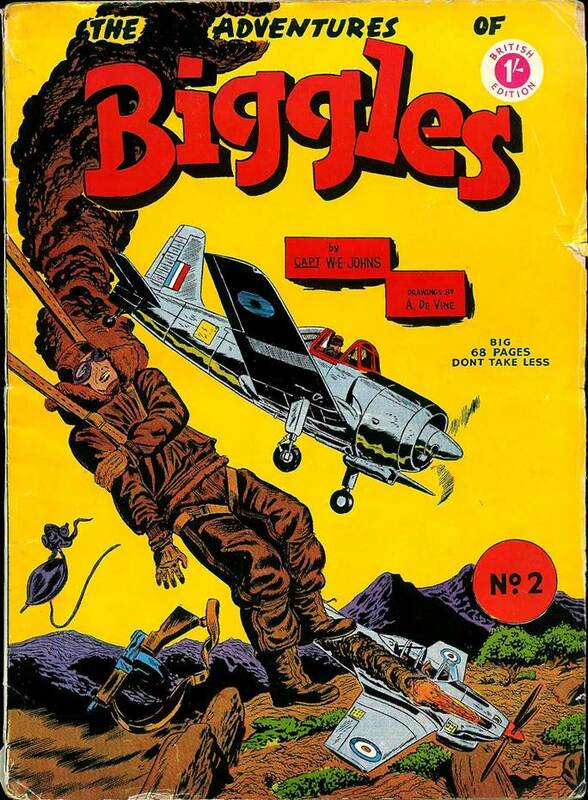 There were then two other cartoon stories which were “non-Biggles” stories and hence they are not illustrated here. “The Crimson Comet - Operation Earthquake” by John Dixon ran to 14 pages. 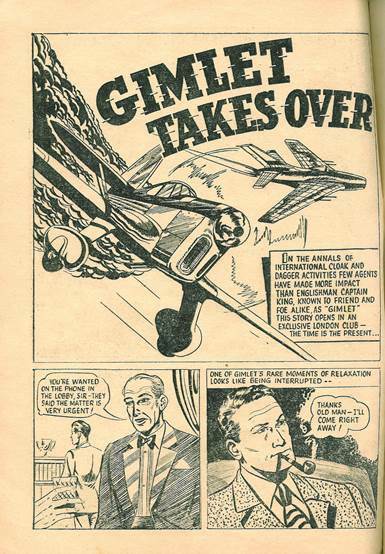 (The Crimson Comet appears to be a ‘Dan Dare’ type character in a birdman ‘superhero’ costume). 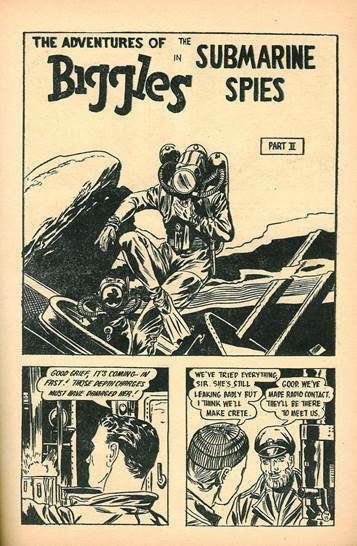 Issue two of “The Air Adventures of Biggles” is again undated. This time there are only two “Biggles” stories and three other stories in the comic. 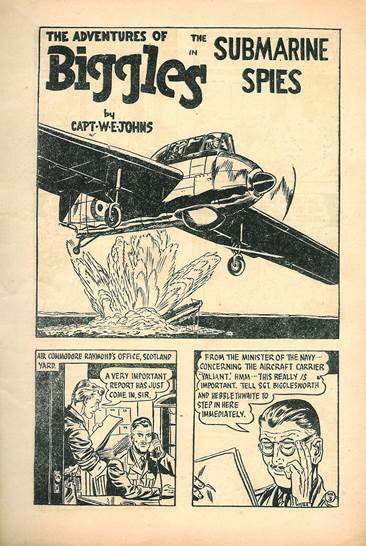 Issue three of “The Air Adventures of Biggles” is again undated. 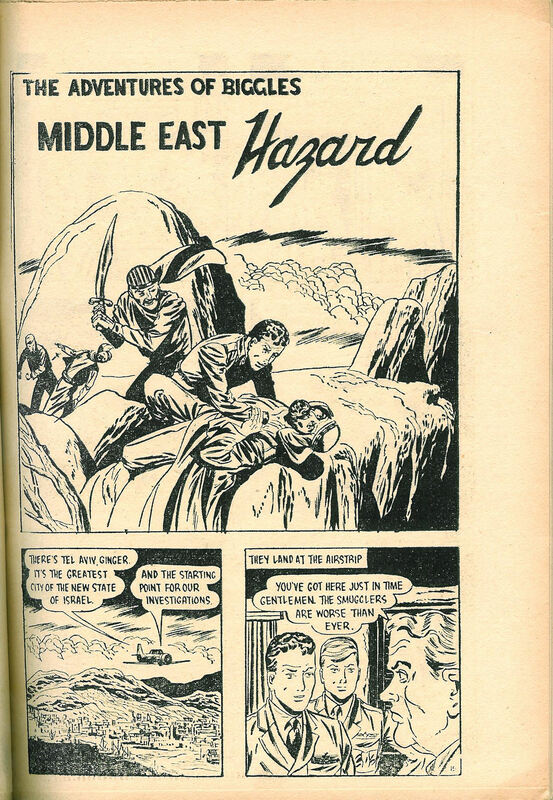 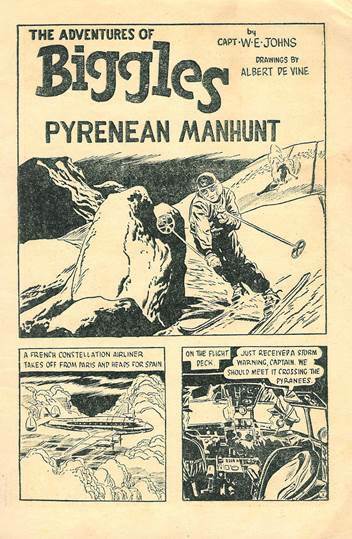 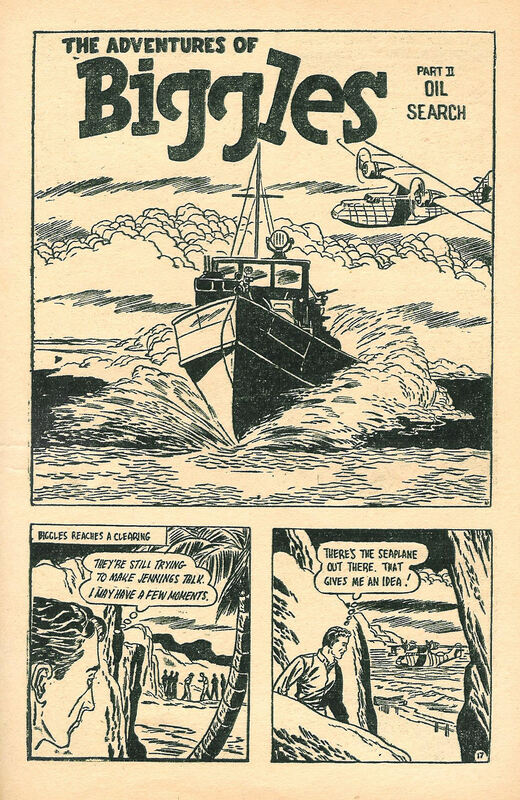 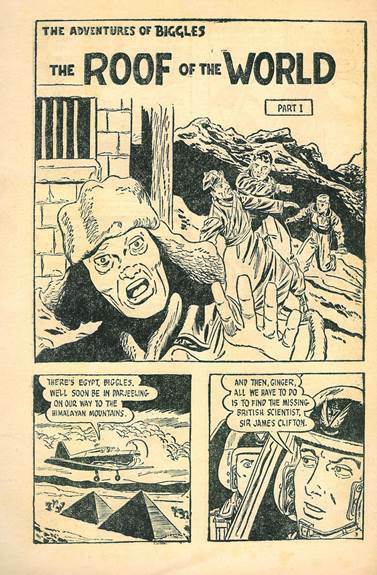 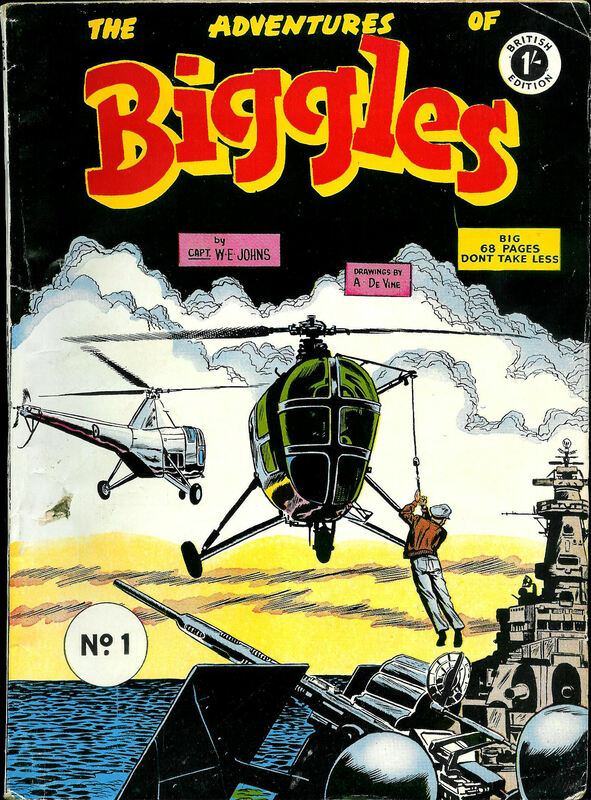 There are three “Biggles” stories and two other stories in the comic. 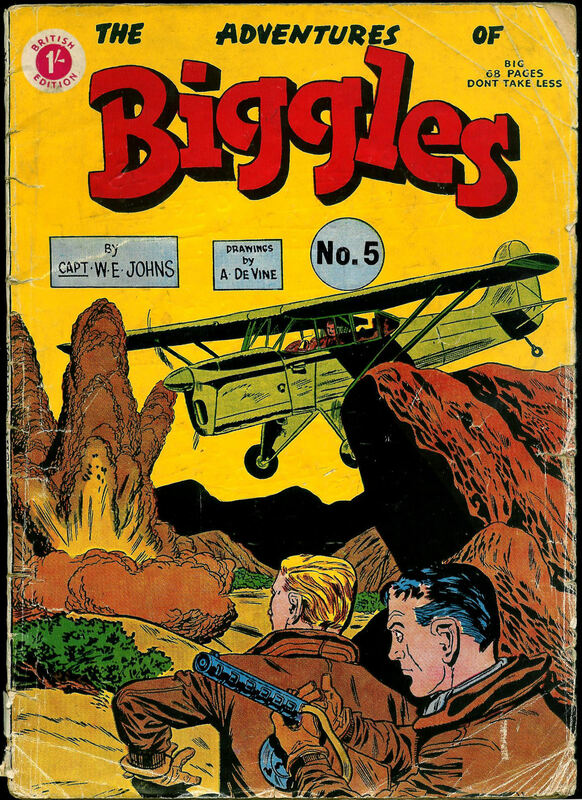 The two other cartoon stories were “non-Biggles” stories and hence they are not illustrated here. 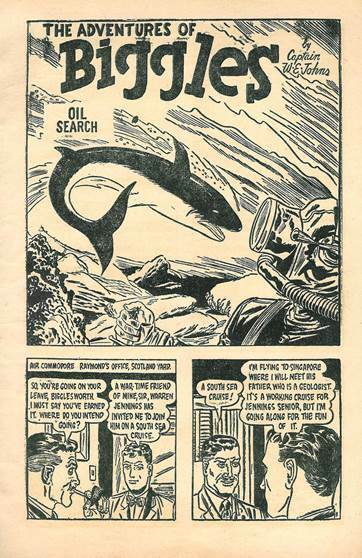 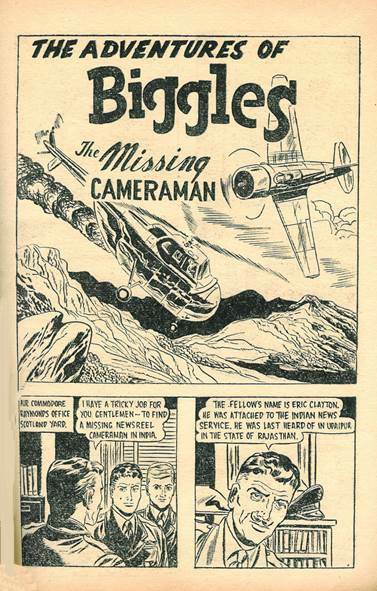 Issue four of “The Air Adventures of Biggles” is again undated. 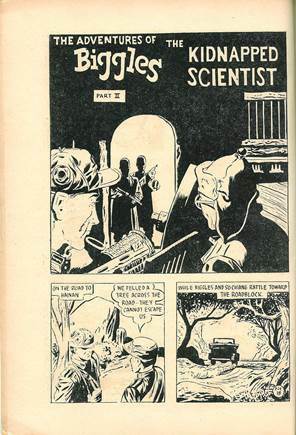 “The Crimson Comet” (uncredited) ran to 14 pages. Issue five of “The Air Adventures of Biggles” is again undated. 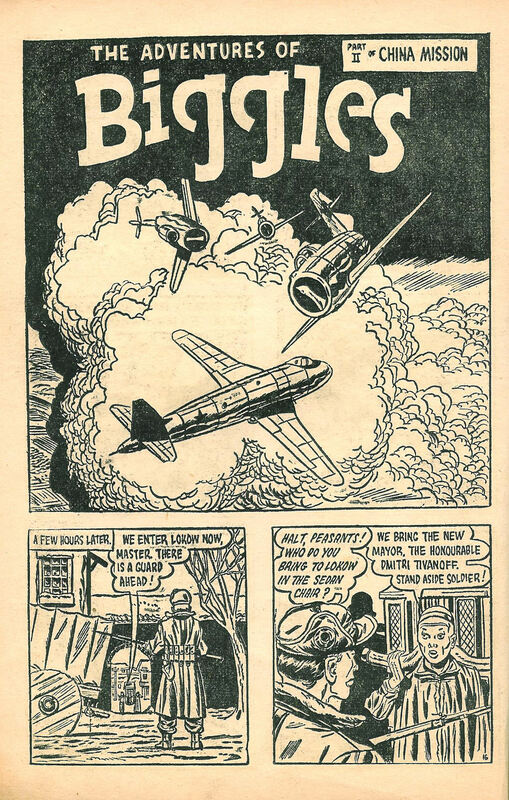 Issue six of “The Air Adventures of Biggles” is again undated. Issue seven of “The Air Adventures of Biggles” is again undated. 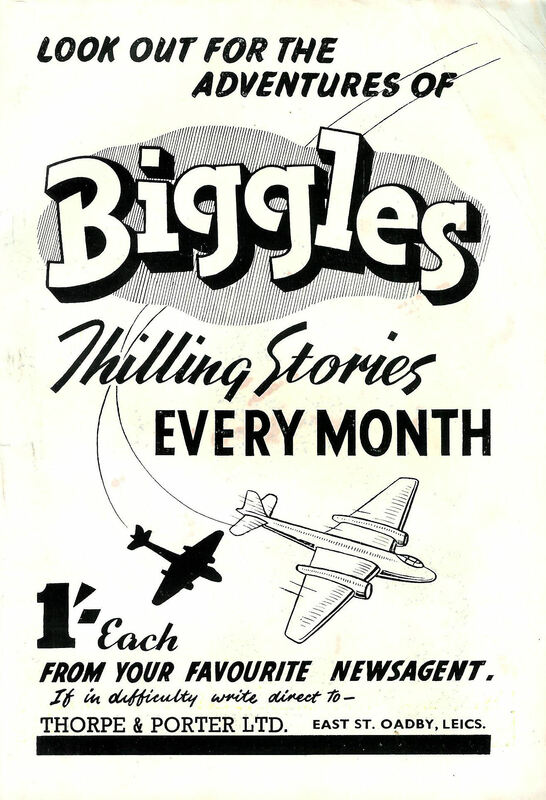 This time there are only two “Biggles” stories and three other stories in the comic BUT one of those other stories is a GIMLET story! 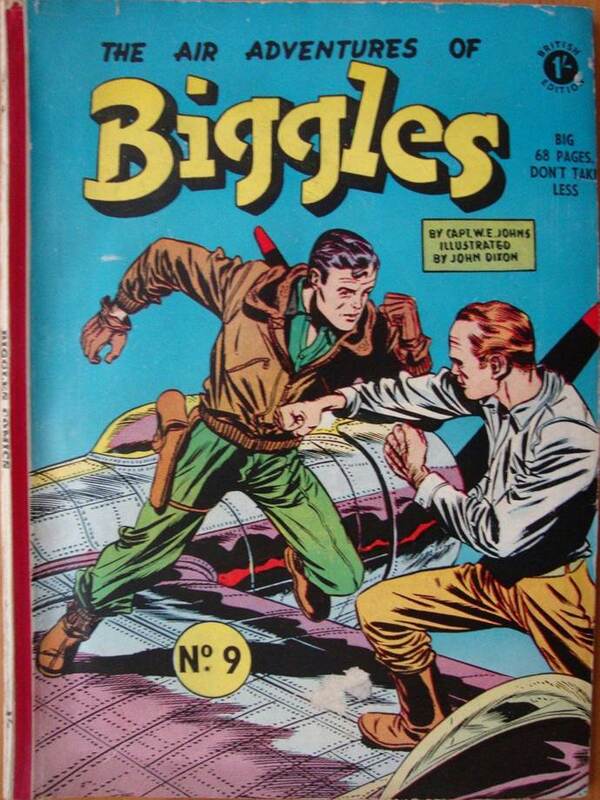 Then the two other cartoon stories were “non-Biggles” stories and hence they are not illustrated here. 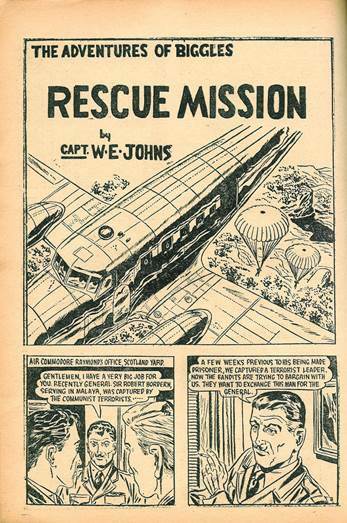 The fourth story was “The Crimson Comet” by John Dixon in an adventure with the rather un-pc name of “Operation Wog” which ran to 14 pages. 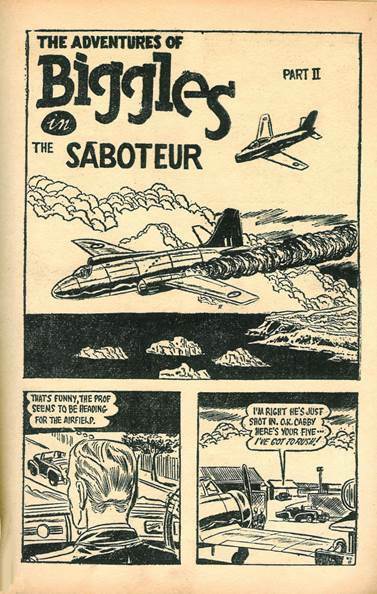 (The story is about preventing “the reds” launching a germ warfare attack on Korea). 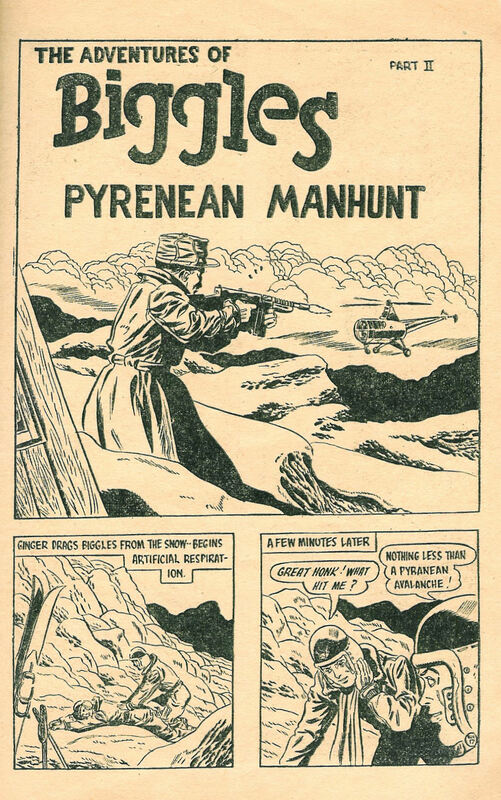 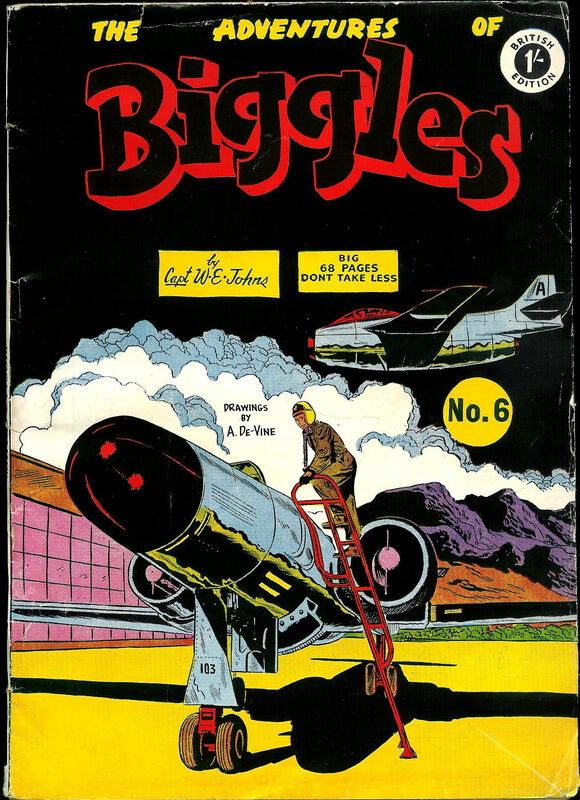 Issue eight of “The Air Adventures of Biggles” is again undated. This time, unusually, there are SIX stories, but only two “Biggles” stories. Of the four other stories in the comic one of those other stories is a GIMLET story. 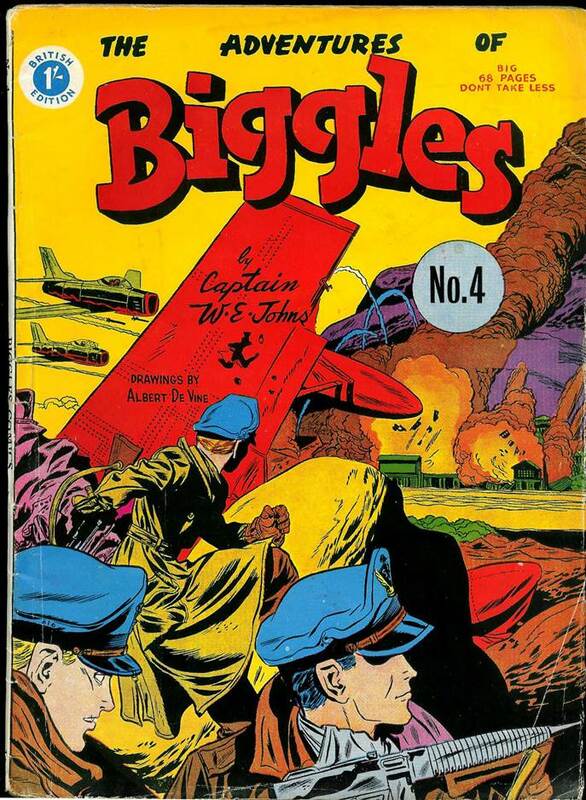 Then the three other cartoon stories were “non-Biggles” stories and hence they are not illustrated here. Although Captain W. E. Johns appears to be credited as the author of a number of these comic book stories – he didn’t actually write any. 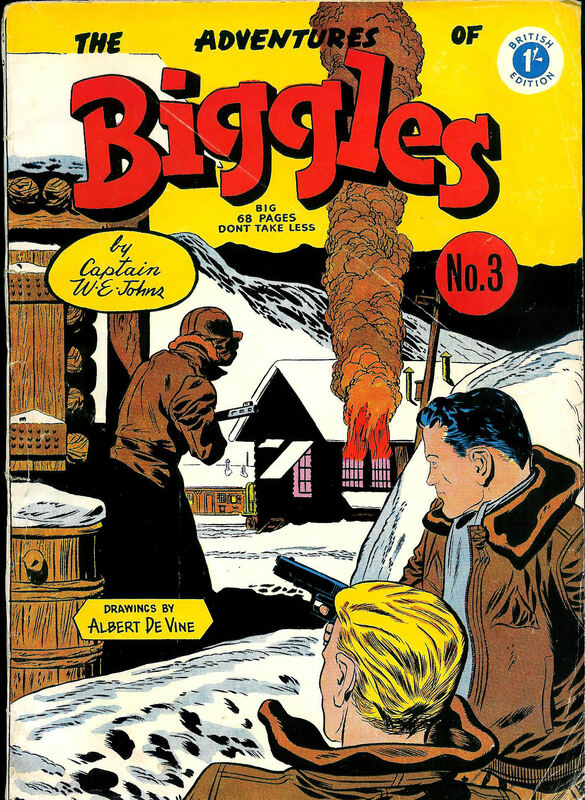 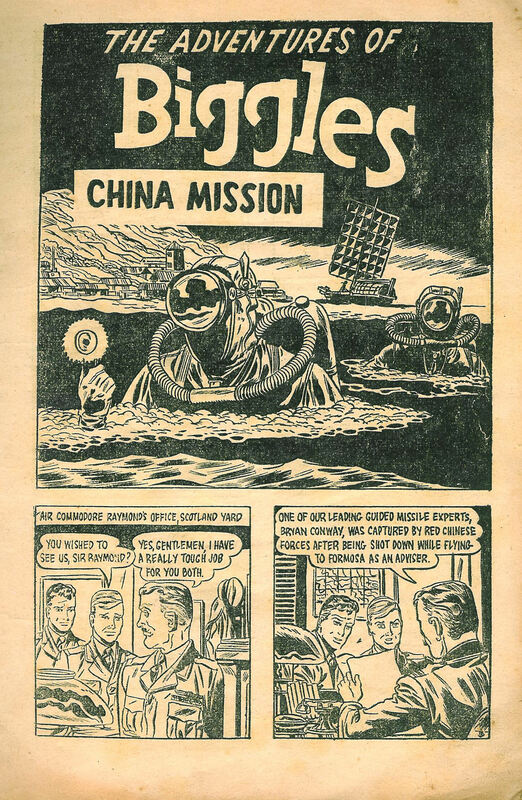 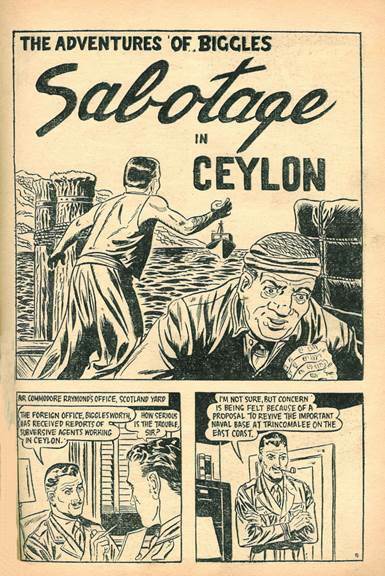 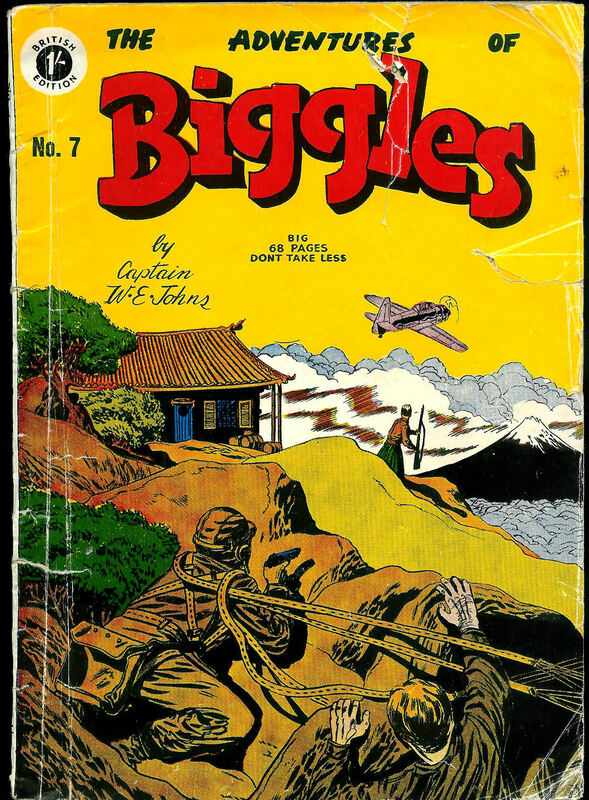 “Biggles” comics are produced in Australia under an arrangement with Captain W. E. Johns, originator of “Biggles”. 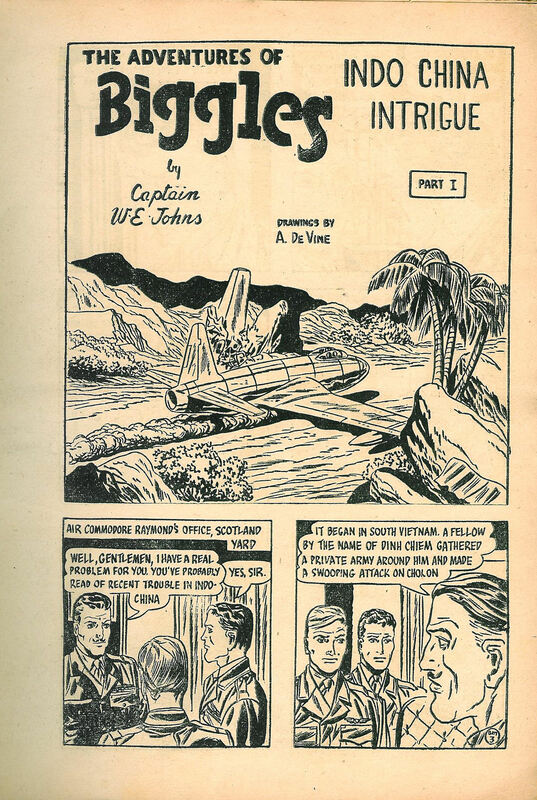 The Australian written scripts are sent to England for approval before publication.